“It took me awhile to get to Jamaican D’s because I am a spice wuss and I feared it. But this is one of the best trucks near CCP and if there isn’t a huge line and I have a hankering for some filling food, I’ll brave it out. The people that work there are super nice and sometimes if you wait a long time they will give you extra plantains or whatever other side dish. 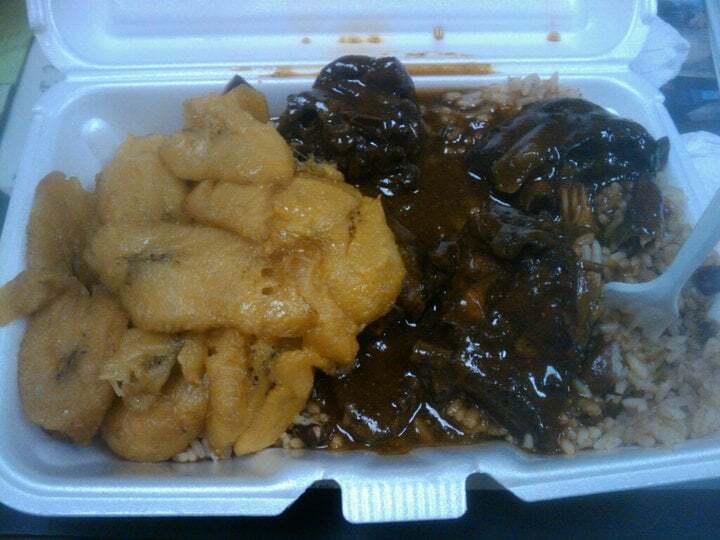 Options that work for me are the Fried Whiting fish, Brown Stew Chicken, and BBQ chicken wings. 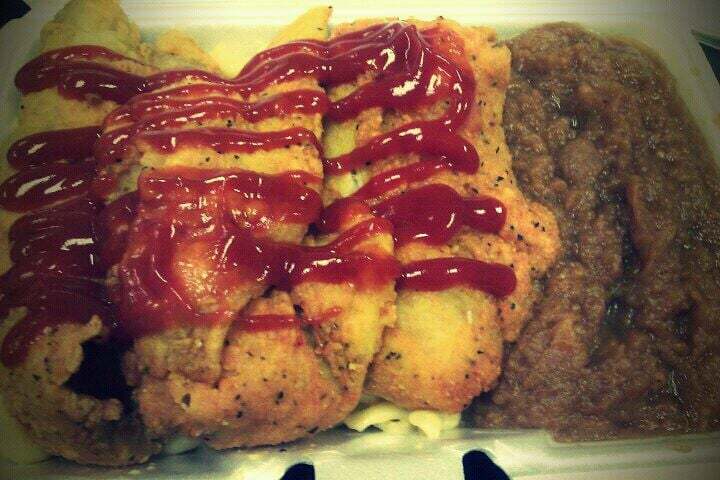 They have platters where you can get sides too for just a couple dollars extra. I love the plantains, sweet potatoes, cornbread, rice and beans, and mac & cheese. Today I got the BBQ chicken wings, which are usually just a tad spicy but today there must have been some rogue peppers that jumped onto my chicken. One of them decided to get stuck in the back of my throat and clung on for dear life. I grabbed for my water and sent it flying across my desk in desperation. After throwing a wad of napkins onto the new lake forming on my desk, I proceeded to glug down the remainder of the bottle trying to get the pepper unstuck from the back of my mouth. Finally after drinking two bottles of water, sweet relief washed it down. I say this only to let those like me to beware the chicken. Sometimes you may get burned! However, the rest of the platter was much less painful to consume. If you like spices, they now sell their famous jerk sauce in bottles! Scotch bonnet peppers galore! I was reluctant to visit the Temple Jamaican D’s since the prices seemed a bit steep when compared to other choices on campus. However, one day I finally did and I learned why. The “medium” sized platter was enough for 2-3 meals! You can share with a friend or have leftovers for another day! Check out the size of this portion of BBQ wings, sweet potatoes, and mac & cheese! All of this for $11. It was super tasty and the wings alone made me feel totally full. “Medium” platter. Does a large feed an army?? On my next visit, I opted for the “small” platter with the Sweet & Spicy chicken. This was much more manageable but still huge. The food was excellent, spicy (more spicy than the 2010 me would have preferred) and full of flavor. The sweet & spicy chicken had more breading and larger pieces, and the BBQ wings were super tangy and vinegary. Click on the menus below to view them larger.